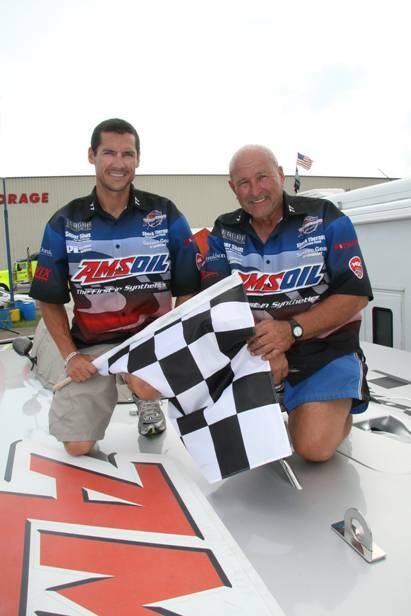 The AMSOIL Offshore Racing Team was created by owner Bob Teague, throttleman (Valencia, CA), and Paul Whittier, driver (Yarrow Point, WA). 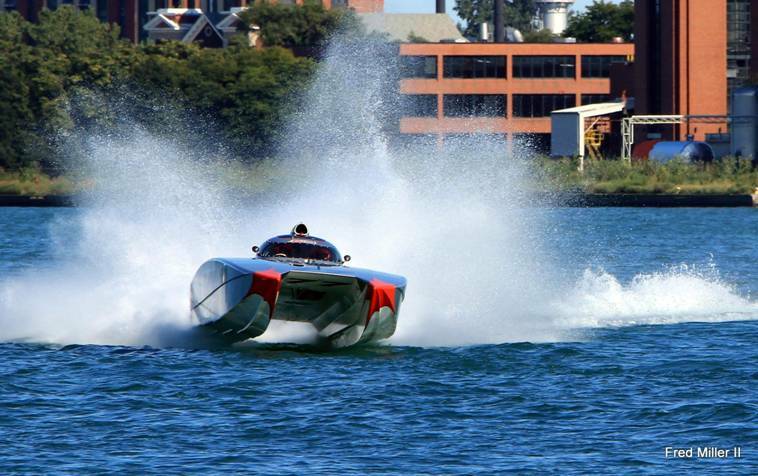 Both Teague and Whittier are mainstays in the boat racing scene, each with several national and world championship titles under their belts in several different categories of racing. Teague, owner of Teague Custom Marine in Valencia, CA, has completed over 1000 races during his career. However, with the establishment of Team AMSOIL, it was the first time that the two long-time friends would be in the same boat instead of in competing boats on the race course. The addition of AMSOIL Products Inc. from Superior, Wisconsin as the title sponsor of the Team has proven to be an unstoppable driving force. Driver, Paul Whittier, left, and Owner/Throttleman Bob Teague, right, after a win in Harrison Township, MI. The sleek silver Skater 368 boat debuted in the middle of the 2007 season and has boldly competed in events across many race sanctioning organizations, including Offshore Super Series (OSS), Offshore Powerboat Association (OPA), and Super Boat International (SBI). This has created an extremely full and diversified racing schedule for the Team each season. Team AMSOIL held the title as Super Cat Lite National and World Champions Back-to-Back-to-Back, 2010-2012 and was also OPA High Points Champion in 2011. Other notable accomplishments by the Team include setting the Official Endurance Record sanctioned by OSS in 2008 in the Cat Lite Class from Miami, Florida to Bimini, Bahamas and back. The next year, the team returned with a mission of defending and beating its own record in the 106 mile long race. On Friday, June 12th, 2009, Team AMSOIL #77 did just that by running the endurance event in 59 minutes and 40 seconds, which was a little over 5 minutes faster than last the previous year’s record. The official average speed of the Team was recorded at 106.8174 MPH. 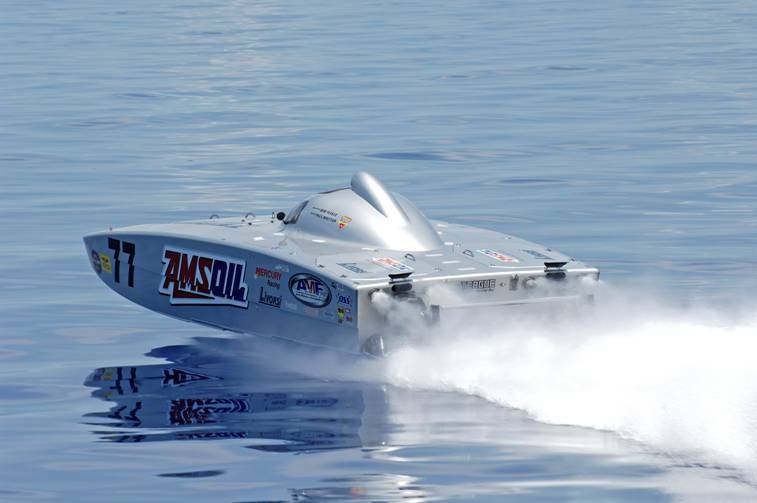 Team AMSOIL competing in the Bimini Ocean Run in 2009 – a 106-plus mile ocean race from Miami, FL to Bimini, Bahamas and back – and breaking their own endurance record from the previous year. 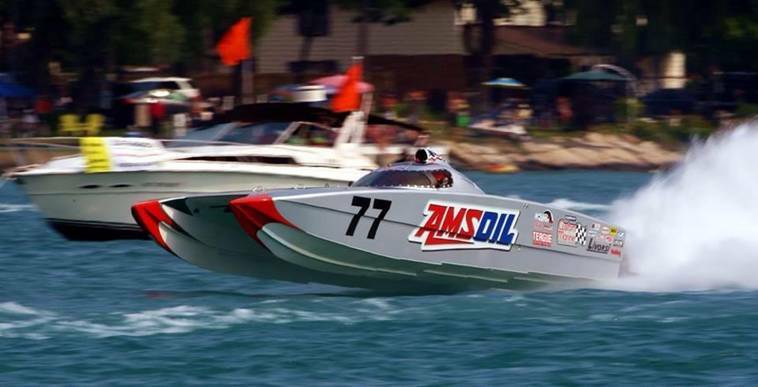 Following a year-and-a-half hiatus from offshore powerboat racing, Team AMSOIL Offshore Racing was assembled for duty in Saint Clair, Michigan for the 20th annual Bluewater Offshore Racing Association’s Saint Clair River Classic in July 2014. The Team brought the same tried and true silver Skater 368 fans are familiar with, except with a little bit more firepower under the hatches. Teague Custom Marine had been working for months rerigging the boat and building two pairs of the “750 HP” specification engines to campaign the boat in the new Super Cat and Super Boat classes. Suffice to say: with 1600 Horsepower, 7000 RPM, 1.61:1 gear ratios, 9500 pound minimum weight, and a completely different range of propellers, this was going to be a whole new ballgame for the AMSOIL Offshore race team. The boat was finished just days before the trip from California to Michigan and without a local crane or marina in California, the team dropped the boat in the water for the first time at River’s Bend Marina in Saint Clair, the home base of competitor Cleveland Construction. For her maiden race, veteran Bob Teague would retain his throttling duties, while his son John would step in to drive. They took the boat out for a shakedown run, checking and setting pressures, temperatures, and fuel mixture for the first time outside of the dyno room. After fixing a few minor bugs and making a few minor adjustments, they ran again, and were generally pleased with how the boat performed. The team was unsure of how the additional weight would affect the drivability of the Skater, but their fears were not realized, as the boat was if anything, showing more potential than it had in the Super Cat Lite Configuration. Once testing began, lap time comparisons confirmed that right out of the box, the new setup was competitive. Sunday’s race started with the AMSOIL 368 Skater lining up against the Broadco 40 MTI and the 388 Skaters of Cleveland Construction and Phoenix Parts. AMSOIL was in lane 3 with Broadco then Phoenix Parts inside of them. The conditions were smooth and wind was westerly and minimal, which would make for fast and dicey racing on the right-hand modified oval. On the drop of the green flag, all four boats drag raced down the Saint Clair boardwalk to turn one and entered the turn almost side by side. Broadco would come out first, with AMSOIL on their outside quarter, and Phoenix Parts to the inside about a length behind that. Broadco pulled away about a length in the first half of the straight, but the AMSOIL Skater was charging up behind in the second half of the straight. For the first two laps, Broadco owned the inside line, hitting every pin religiously. Eventually, they left one late apex pin open and Team AMSOIL dove the boat behind Broadco on the inside. Team AMSOIL was making good time running a line in combination with Broadco’s, but soon lap traffic came into play which hindered Team AMSOIL from making a late race charge. Team AMSOIL finished in a strong 2nd Place, only 17 seconds behind Broadco over the 12 lap race. Although they didn’t win, the Teams feels that the weekend was an overall success given it was their first outing in an entirely different racing vehicle. 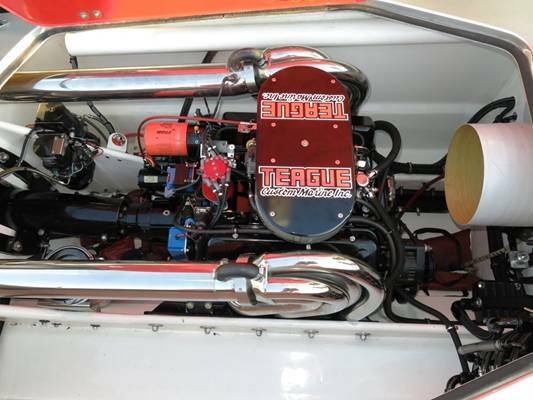 The Teague Custom Marine engines and rigging performed flawlessly and even after a hard high-RPM smooth water race, the bilges were clean of oil or debris. The whole team gained valuable setup experience that will hopefully contribute to fielding a championship effort in the new Super Cat Class. Two short weeks after their first weekend back in action with new Teague Custom Marine Super Cat class spec engines and a strong second place finish against the Broadco MTI in Saint Clair, Team AMSOIL Offshore came back for a second serving of racing on the Saint Clair River just miles up the road in Port Huron, MI for the International Offshore Powerboat Race. Paul Whittier joined Bob Teague in the driver seat for his first time with the new engines. Even with limited testing, the boat was working so well he agreed with the rest of the crew: The #77 Skater is even better than it was as a Cat Lite. On the drop of the green flag in Port Huron, Broadco timed the start from behind just right and accelerated into the first turn two lengths ahead of AMSOIL. They held the second lane as just that, forcing AMSOIL into a tight hairpin just off the buoys. Both boats pointed downriver for the 2.5 mile drag race. As they accelerated above 120 MPH, the AMSOIL Skater started to stretch its legs, walking past the MTI. Both boats set up for turn two at almost 140 MPH. AMSOIL commanded the inside lane and hit the first pin. As they swung around the apex of the turn, Broadco saw an opportunity to dive inside and grab the second pin. The MTI tried to cross behind AMSOIL, but didn’t dive in hard enough and rode the Skaters rooster tail up. When Broadco came back down, the boat grabbed and dove in towards the pin, but the damage was already done. The MTI scrubbed too much speed in the failed move, and lost over 4 seconds in that one turn. The AMSOIL Skater screamed past the American crowd at over 135 MPH upriver as it completed lap one in the lead. Bob and Paul put in 6 more fast and tidy laps, extending the lead to 14 seconds, which they held until the finish of the 12 lap race. 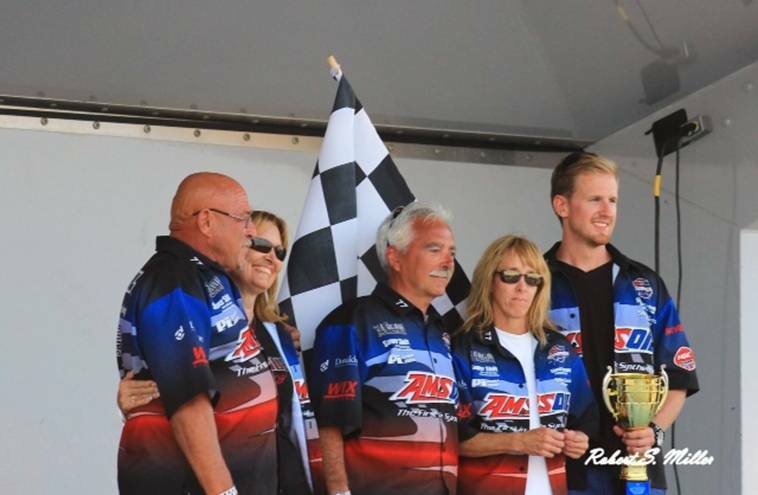 Team AMSOIL celebrated their first Super Cat victory! 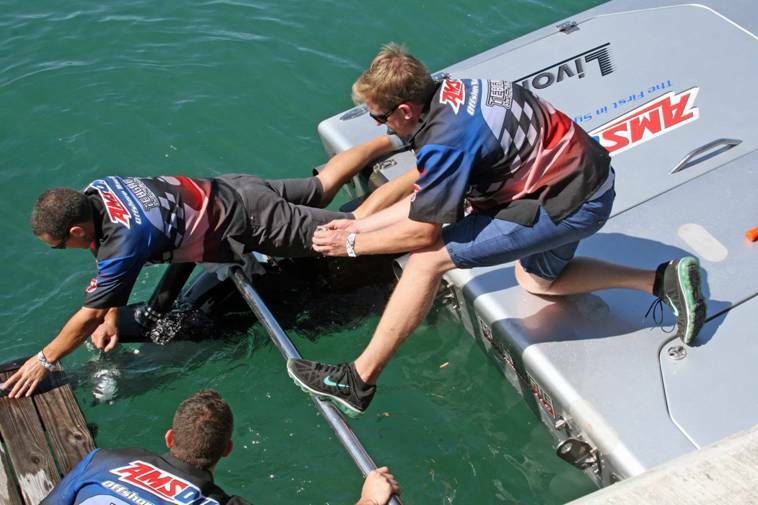 Team AMSOIL Offshore competed in the First Annual Downtown Detroit River International Powerboat Challenge held on September 5th through September 7th. 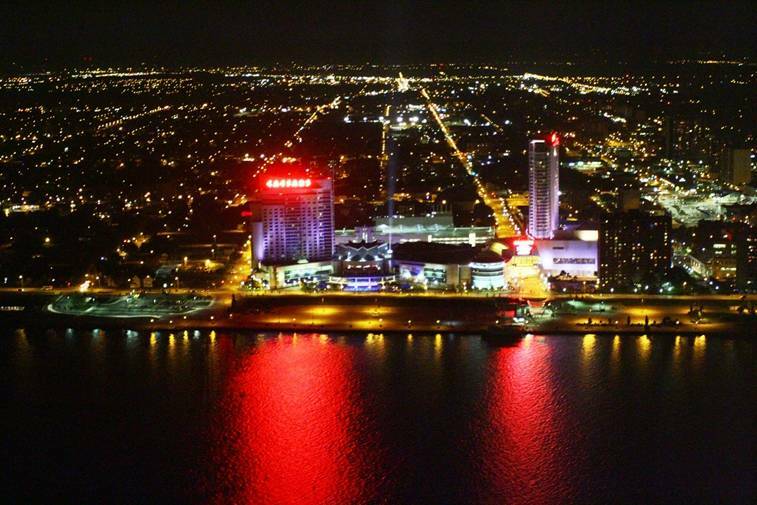 The 5 mile race course was centered at the Marriott/GM at the Renaissance Center in Detroit and covered the river in the United States and Canada. This also provided great viewing for spectators in Windsor on the Canadian side. Being that the race was run later in the day, the weather changed resulting in a pretty stiff wind blowing up the Detroit River which caused much rougher conditions, especially in the down river turn. Team AMSOIL’s set up wasn’t ideal for the conditions so Bob Teague was required to make adjustments with trim to compensate. 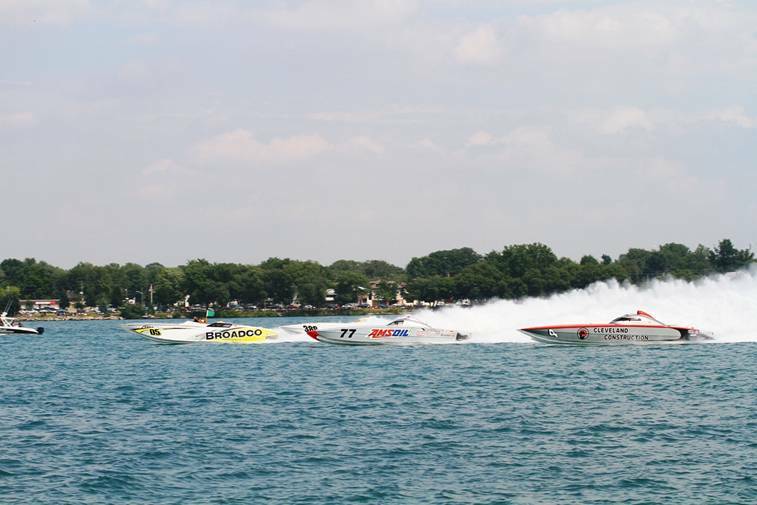 Team AMSOIL was assigned the outside lane at the start because of the win at the previous race in Port Huron, MI. When the green flag dropped, Team AMSOIL took a slight lead down the first straightaway leaving room for the Cleveland Construction boat through the turn. After that Bob and Paul accelerated the AMSOIL Skater up the back stretch extending the lead and continued to pull away for the balance of the race. 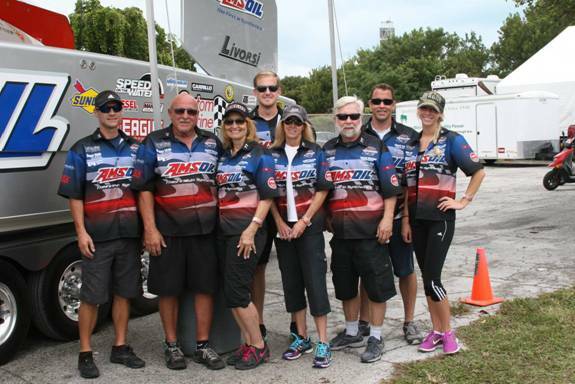 Team AMSOIL would endure some ups and downs at the final OPA event of 2014. 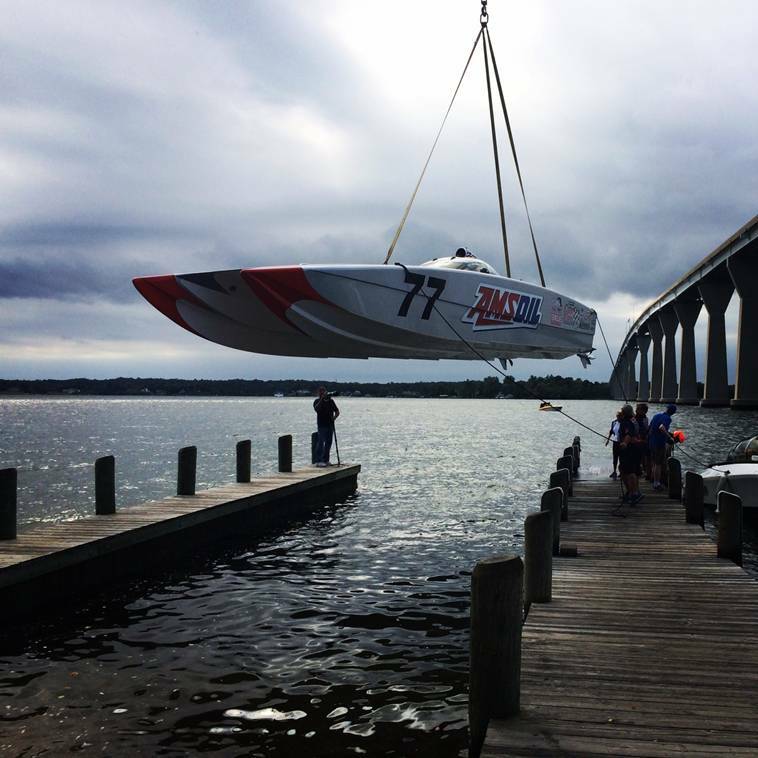 OPA Racing held their Grand Prix National Race and World Championships in Solomons, Maryland last year as a combined event, October 2-5. The Solomons race was declared a double header cumulative points event, with the first race deciding the season’s National Points Champions, and the first and second races combined deciding the OPA World Champions. 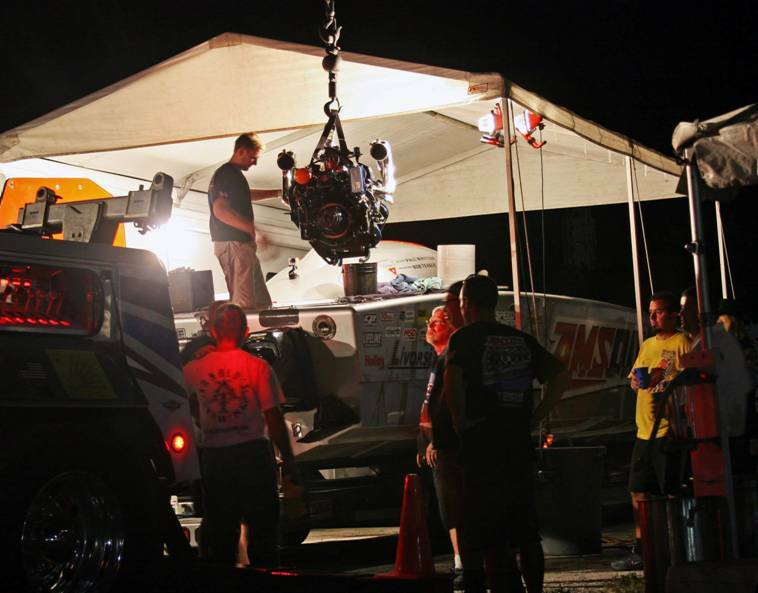 Team AMSOIL said goodbye to Michigan and the ever-hospitable Rivers Bend Marina and made the trek to Maryland to compete for the OPA Super Cat World Title. At the first of two races in Solomons, three Super Cats made the call, with Cleveland Construction and #NoFilter lining up against the AMSOIL Skater. A larger than usual fleet of unlimited cats also showed up, including the turbine MTI Marymac. The Super Cats started behind the larger boats, and all 3 barreled down the front straight. Right when they were about to enter turn one, AMSOIL slowed and pulled off course. The crew caught the boat at the crane dock to bad news: no fuel pressure. The fuel system was double checked with only one conclusion: dead fuel pump. The pump was changed on the dock, but the race was only 40 miles, and there was no time to get back out on the course. The AMSOIL Team had to take a disappointing DNF for the day. It was not the only drama on the race course: the 57 MTI #NoFilter collided with the Marymac MTI while attempting to overtake on the inside lane, seriously damaging both boats, then ran over a turn buoy in the chaos. The AMSOIL Team knew they had the setup nailed for Saturday, so they came into Sunday looking to prove a point. As the Super Cats took the green flag, the silver Skater flew ahead of the competition, on pole and in the inside lane for turn one. The setup could not have been any better, ultimately resulting in a 1st overall finish on Sunday and overall second place for the two race event. Although a DNF is never satisfactory, the Team was able to sort out some gremlins in the new setup that could have hampered their efforts at the next event: the 3 race SBI Key West World Championships. To cap off the season, the AMSOIL Offshore Racing Team took Highway 1 down the Florida Keys to the southernmost point in the United States and also the site of the largest offshore race of the year, Key West. The event consisted of three races across three different days for the Team. 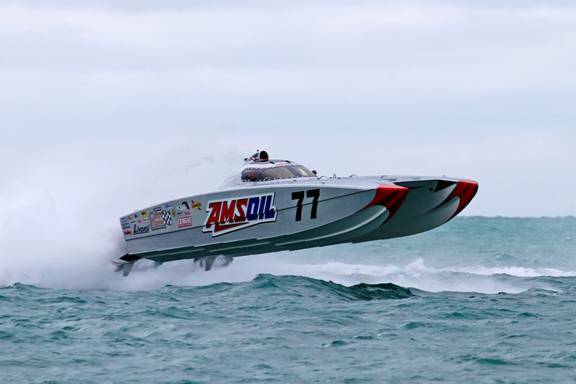 Being that the AMSOIL Super Boat had not yet been run in the ocean, let alone Key West, which is notably tricky because of both course setup and water conditions, the first test session, would be critical. Luckily, the team honed in on a proper setup with only a few changes. In Wednesday’s race, disaster struck. An intake valve broke and dropped into a cylinder, destroying the starboard motor beyond repair. Bob and Paul arced off the course and into the crane area to find the motor locked up. The team would take a last place DNF for the first race. Work began immediately. The starboard engine was disconnected and removed. At the same time, the port motor underwent surgery. Both engines had the same run time, so the intake valves in the running engine were no longer trusted. The team had a complete spare engine on hand that was unfortunately configured for the port side of the boat, creating more work. Cylinder head assemblies that were ready to go on the second spare in California were air freighted and installed on the port engine. SBI Technical Inspectors were invited to view the progress and inspect the engines’ internals. They were pleased at the high level of compliance in the Teague Custom Marine engines. 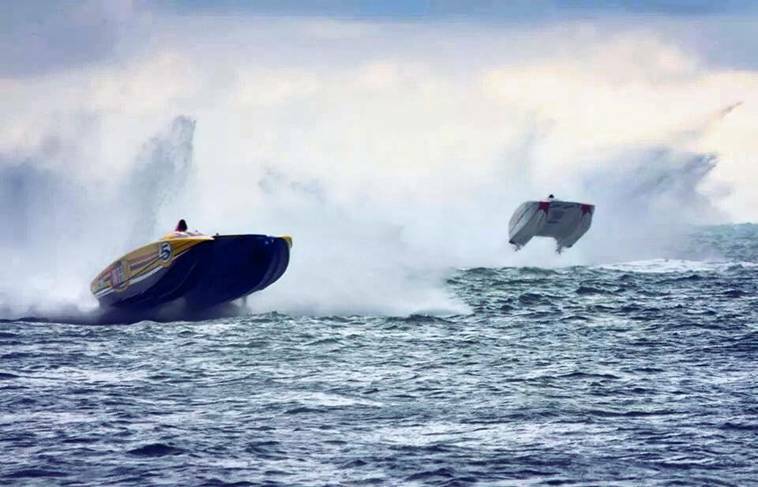 All the Super Boats again made the start line to race in the main event on Friday. The AMSOIL Skater got a fair start again, and was running 4th on the first lap. Broadco got the best start, and was in first, followed by Stihl and WHM. It became apparent Broadco was quicker, but Stihl had longer legs and top speed. WHM and AMSOIL were running similar times. On lap 3, the WHM Skater spun in the Mallory Square U-Turn, stopping facing backwards past the apex. AMSOIL zoomed by, and WHM joined in hot pursuit. Then another plot twist, Stihl slowed and retired with an ignition issue. As the race went on and Bob and Paul completed more laps, their average speed improved considerably. By the end of the race, they were gapping WHM by one second per lap and matching Broadco’s pace. The team was thrilled with the second place finish and a flawless performance from all the boat’s equipment. On Sunday, the storm rolled in. There was a lot of speculation about the conditions. The wind was scheduled to turn 180 degrees through the day. Bob and Paul got stuck in a bad spot for the start, with their backs to the pace boat. They got caught up with Warpaint before they could get to Turn 1, and came back into the island in 5th. The Super Boat fleet returning to complete lap 1 was spectacular. Stihl ran in 1st with nothing to lose and hit the big Turn 2 holes and stood it nearly straight up and down on the transom. Out of all the boats, the smaller 368 Skater #77 came around that first lap on the outside perfectly flat and composed, running hard. By the 3rd lap, AMSOIL had passed Warpaint and was actually gaining the most on the larger boats in the roughest section of the course. Bob was running the boat hard, there was no other way to survive in the horrendous conditions, but not risky. As Broadco, WHM, and AMSOIL were about evenly spaced, WHM slowed and continued the last two laps on one engine. The conditions were so rough that their fuel system on one side sucked a large air bubble and could not be reprimed. Broadco continued running uncontested in 1st to the finish, with AMSOIL in close pursuit, finishing 2nd. After the points were calculated for the weekend, Broadco was named Champion, followed by AMSOIL, and then Racing for Cancer. It was a monumental effort to bring a new setup to Key West, practically destroy the engines on the first day, and rebuild the boat to finish 2nd overall for the weekend. After a very memorable race season, it was time for the rigs to head back to Valencia, California for the winter. 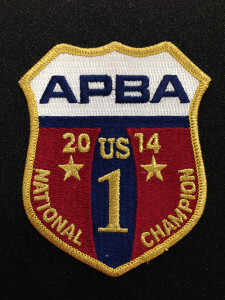 Team AMSOIL Offshore Racing received a top honor from the American Power Boat Association (APBA) for the 2014 racing season. 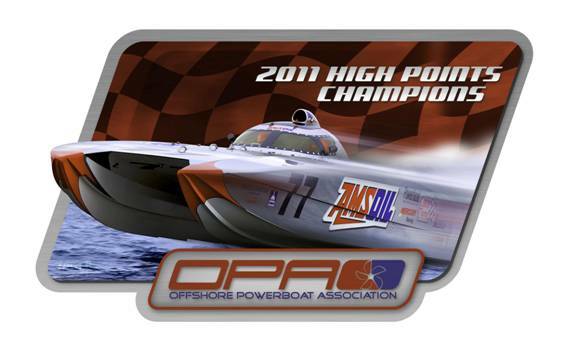 Team AMSOIL is the US-1 Offshore National High Point Winner in the Super Cat Class. This is an outstanding achievement from the Team’s first year racing in the Super Cat / Super Boat classes with class spec TCM 510ci BBC engines built by Teague Custom Marine Inc. 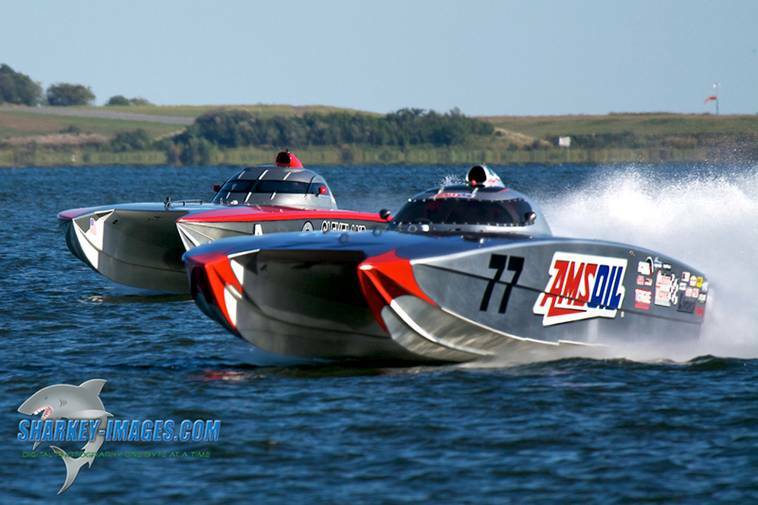 Although the green flag has yet to drop at any race events in 2015, the well known AMSOIL Offshore Race boat has already made a few appearances. In January, the boat was displayed for a day at the Motorcycle Mechanics Institute (MMI) in Phoenix, AZ. 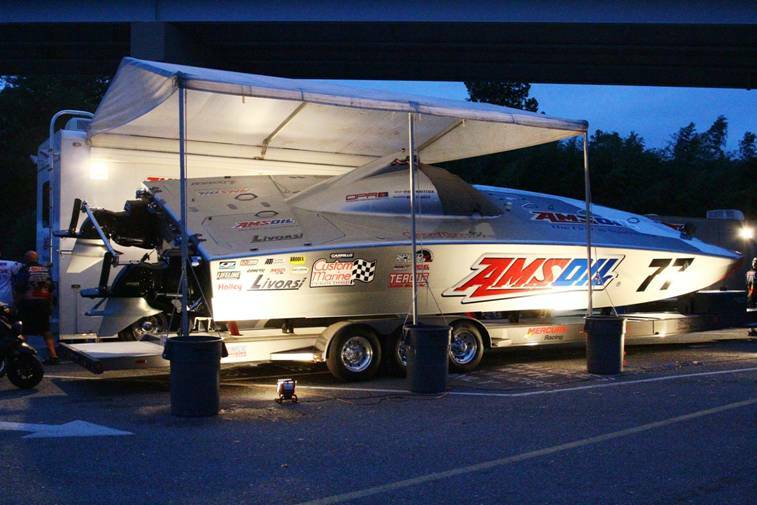 Bob Teague personally delivered the boat and attended as a guest speaker during educational seminars setup by AMSOIL. The AMSOIL Racing Department was in town for the Monster Energy Supercross races that weekend. 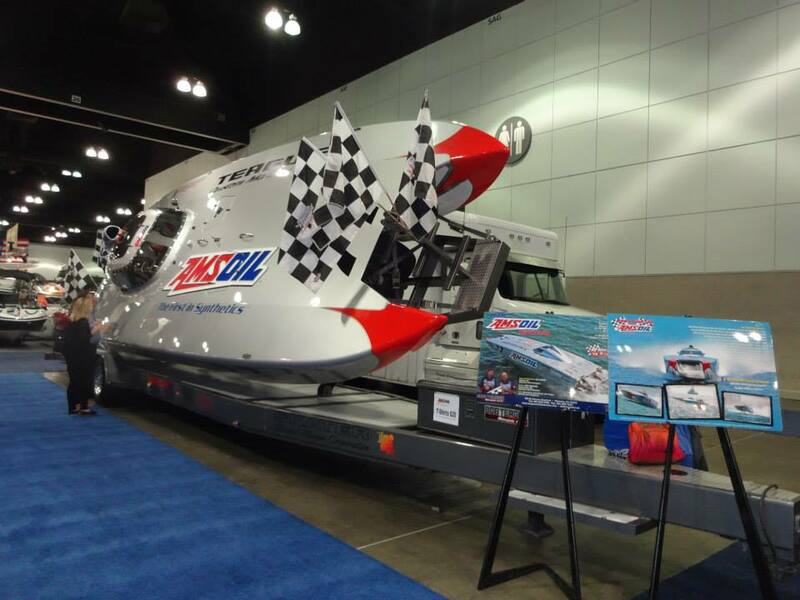 About a month later, the AMSOIL Offshore Race boat and tow rig were on display in the main show floor of the Los Angeles Boat Show, which was open February 19-22, 2015. Fans and show attendees were able to see the race boat up close and had the opportunity to take photos, buy official Team apparel at the Teague Custom Marine booth, and even meet Bob Teague and get an autographed Hero Card with Team photos. Team AMSOIL Offshore Racing is making preparations and checking all systems to be ready for the upcoming season. We are excited to race in the Super Cat class in 2015 and will be releasing our schedule of events soon. 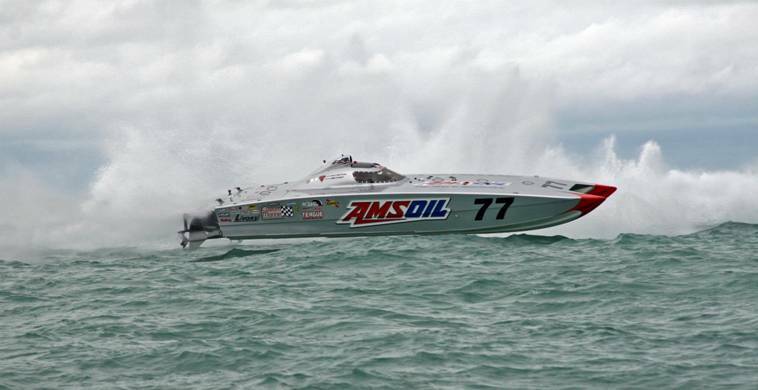 AMSOIL’s great sponsorship package, dedicated racing department team and superior lubricants all make it possible for Team AMSOIL Offshore Racing to achieve success! The AMSOIL Dominator Racing Oil continues to be proven as the best choice for all extreme performance marine engines. The Team has also proven that the absolute best oil for a Mercury dry-sump VISSM drive is AMSOIL Severe Gear for the ultimate in gear protection with minimal parasitic power loss. Teague Custom Marine is an authorized AMSOIL dealer and offers the complete line of high performance lubricants in its store and for purchase over the phone. There are also opportunities available for you to become a dealer! Stay tuned as we will be releasing our race schedule for 2015. See you at the races! Follow both Teague Custom Marine & AMSOIL Offshore Racing #77 on Facebook! This entry was posted in Teague Blog, Teague Offshore Racing by Teague Custom Marine. Bookmark the permalink.